Push Your Luck Podcast: Dungeon of Mandom Review - Who's the Bravest Delver of Them All ? 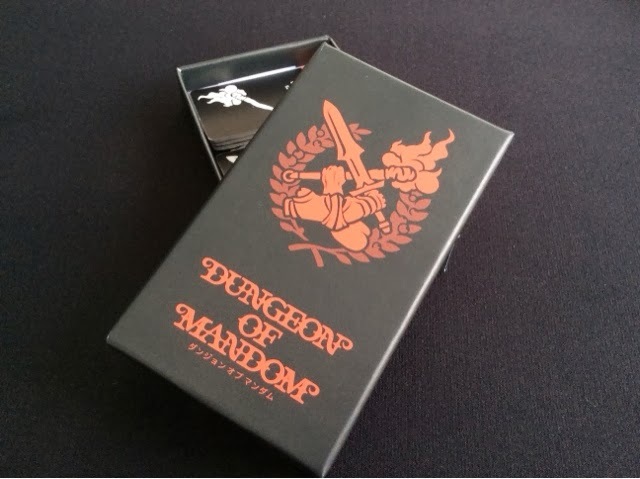 Dungeon of Mandom is a micro game in the same vein as love letter. The game is made up of 13 cards ( or 17 cards if you count the player health & win marker ) and a bunch of cardboard tiles. That's about it. It's a bluffing and push your luck game where players are trying to be the bravest ( and victorious ) adventurer to enter the dungeon or to be the smartest trickster to flee from impending death. 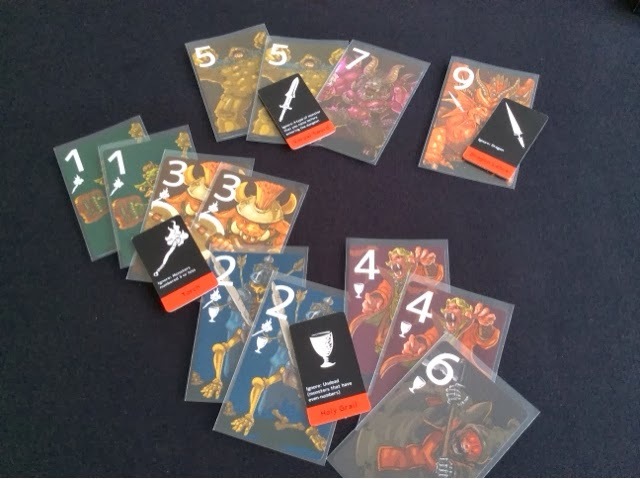 At the start of the game, each player is given a card which has 3 functions - track the player's health, track the player's points, and to show the breakdown of the cards in the game. 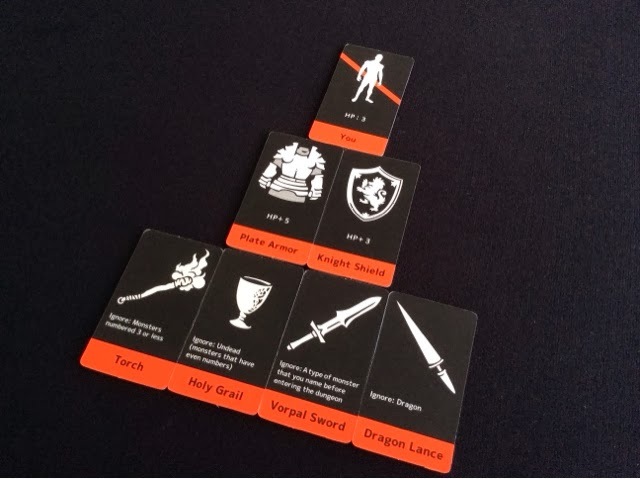 The card itself is not important for the game, but it is a handy way to keep track of all the elements in the game. 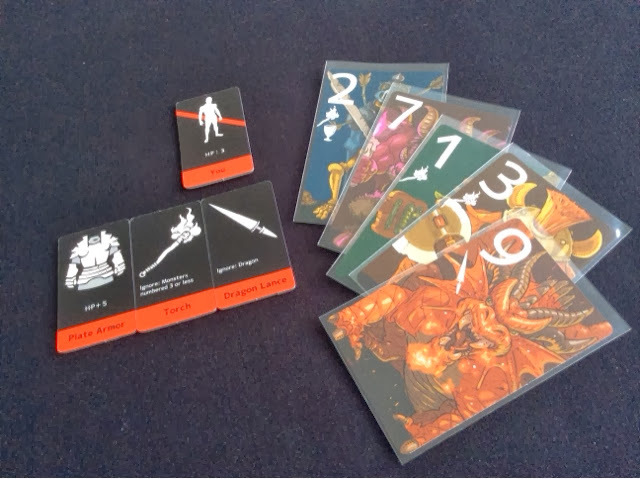 The important part of the game are the adventurer tiles and the deck of monsters. The players share a common adventurer who starts each round fully equipped for battle. On a player's turn, he/she has only 2 options - draw a card or pass. If the player passes, he/she is out of the round and loses the chance to venture into the dungeon. Once all but one player has passed, the remaining player will be the one who has to delve into the dungeon with whatever equipment is left on the adventurer. The player who has been left with the task to face the dungeon will then open the dungeon cards one at a time. For each monster revealed, the adventurer will check if he/she has the appropriate equipment to vanquish the monster. So if a monster valued 1, 2 or 3 is revealed, and the player has the torch, he/she will vanquish the monster. Each equipment may vanquish any number of monsters of that type, it is not a one use item only. If the adventurer encounters a monster that he/she is unable to vanquish, the adventurer will lose HP equal to the monster's value. So if a monster of value 4 is revealed, and the adventurer had the Holy Grail removed from him/her before entering the dungeon, then the adventurer will lose 4 HP. If the adventurer survives the dungeon, the player will score one victory point. If the adventurer fails to survive, the player will lose one health. Each player starts with 2 health and whoever loses both will be eliminated from the game. The game ends when one player has scored 2 victory points or when one player is the only one left standing. Am I Dead or Alive ?? Everytime I take out the game to play with others, the first thing people always ask me is, "what in the world is Mandom ?" To that I have no reply really. It could have been a poor translation, it could have been some codename for something close to the designer's heart, or it could be pure gibberish. The best guess I can make for what Mandom is is probably the word Awesome. Because that is what this game is. The game has such a strong bluffing element to it that it makes me squeal just thinking about it. When someone puts a monster into the dungeon, you start to think, is that a Demon ? or a Lich ? Then when a player removes an equipment from the game, you too wonder if the monster he/she had put in previously can be vanquished with what is left on the table or has the player willfully sabotaged the adventurer and is deviously leading you blindly into a trap. 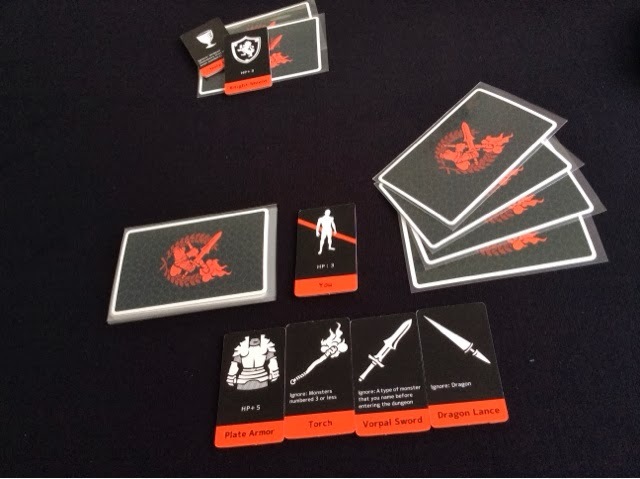 With just 2 actions in the game - take a card and add to the dungeon, or take a card and hurt the adventurer ( who could be yourself ) - so many possibilities exist and there's so much player interactivity that it can really blow your mind. I have seen games where the dungeon was filled with nothing but 1s and 2s and 3s that a mere torch was all you needed. But I have also seen games where there were merely 3 monsters but all of them were the high valued beasts that there was simply no chance of survival. The adventurer equipment tiles are also very finely balanced that none seem more powerful than the other. The torch may seem useless as it only vanquishes monsters valued 1, 2 and 3, but those monsters can really add up. The shield may reward the adventurer with a small boost of +3 HP, but from experience, 1 HP is the difference between survival and death. Each equipment carries its own weight and with each one that is missing, your strategy changes and your thought process gets all jumbled up in knots. Its variability in monster types and unique equipment abilities ensure that no game will play out the same. Different groups will take a different approach to the game and this makes each experience truly unique and satisfying. If you aren't a fan of bluffing and/or push your luck games, then I will honestly say that Dungeon of Mandom may not be the game for you. It's brilliance relies heavily on your enjoyment of these 2 mechanics in games. However, if you enjoy at least a semblance of bluffing, or a hint of pushing your luck, then this game will bring you much joy. I have played a lot of bluffing and push your luck games in my lifetime because I do love them very much, and I will say that Dungeon of Mandom is one of the best out there. Easily in my top 5 list of bluffing games. I've already seen another website where they raved about this game and it made me very much want to play it. Tell me, where/how did you get a hold of a copy of it? you can buy it straight from their website http://oinkgms.com/ (use google translate to read in english). Jonathan emailed the owner directly (sa-at-oinkgms.com) to ask about it. If you do manage to get a copy, let them know Push Your Luck sent you! Thanks!